Despite significant advances in the reduction of healthcare-associated methicillin resistant Staphylococcus aureus (MRSA), the process for prevention of transmission remains tedious, time consuming, demanding of healthcare personnel, costly and, oftentimes, unsuccessful. 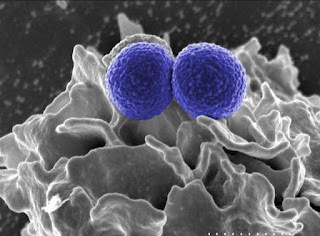 The traditional approach to prevention of transmission of multi-drug resistant organisms (MDROs) has included screening for colonization (e.g., MRSA screening of the nares (either "whole-house" or high-risk patients)), rectal swabs for vancomycin-resistant Enterococcus (VRE), decolonization strategies particularly for MRSA, good hand hygiene and isolation precautions for all MDROs. Decolonization, whether targeted or universal, includes the use of a topical antibiotic (mupirocin) known to temporarily reduce or eradicate shedding of MRSA from the nares and chlorhexidine gluconate (CHG) products for bathing/showering. These strategies are known to be effective, but the long range use of mupirocin in particular is not recommended as there is concern about resistance to the product with long-term use. In addition, the cost as well as the discomfort to patients needs consideration. Newer strategies are emerging, and this includes daily use of an alcohol-based product nasal for nasal decolonization. Alcohol-based products are well tolerated, more cost effective than topical antibiotic products, easy to use and lack concern for resistance. The use of nasal antiseptic products is becoming more widely considered, and many facilities are turning to this strategy in favor of short-term decolonization. Universal decolonization in conjunction with the newer strategies is becoming more popular and trialed in several healthcare facilities as the infection prevention community continues to face challenges with MDRO management, including the complexities of contact precautions. Long-term objectives include eventual elimination of contact precautions for MRSA if universal colonization is successful in eliminating the risk of transmission. Note: I recently wrote a whitepaper published in Infection Control Today (ICT) on "Emerging Strategies on Achieving Nasal Decolonization for Reducing Hospital-Acquired Infections." Issues covered include the current status of MRSA HAIs, their financial impact and transmission prevention strategies. The whitepaper, sponsored by Nozin Nasal Sanitizer antiseptic, is available for download here. An account with ICT is required; signing up is free and can be completed as part of the whitepaper download process.